Sometime in 1951, CEC began to seriously explore the possibility of building a digital computer that could be attached to the mass spectrometer or possibly used in other scientific calculations. A target price of $50,000 was set for the box. The possibility of the machine being used as a general purpose computer in both scientific and commercial applications was a clear possibility, too. Sibyl Rock was dispatched to talk to key CEC customers and industrial groups about their interest in the product. Also in 1951, CEC committed Jim Bradburn and a small group of engineers to the task of exploring the feasibility and beginning design work for their digital computer. Dr. Harry Huskey had been hired to train the group in digital computer design. Huskey had just finished building the worlds fastest computer, the SWAC on the UCLA campus in 1950. Huskey lectured at 7:45pm on Tuesdays in late 1951 and early 1952. His lectures alternated between circuit techniques and mathematical topics such as Matrix Mathematics. The Binary Coded Decimal representation for numbers was quickly agreed to and a word size of eight BCD digits plus sign was settled on. At the beginning of 1952, the small group of engineers began weekly coordination meetings chaired by R. L. Sink. These one-hour sessions were put in place "to discuss and to obtain an overall view of our problems and objectives." Minutes were taken with the task rotating among the attendees. Engineers present at the January 14, 1952 meeting were: Martin Shuler, Jim Paquin, Norton Bell, John Alrich & Sink. Another key member of the early designers was Fred Fox who was absent from that particular meeting. This manual, bulletin 3000, would undergo several revisions until bulletin 3000C became the final version. Bulletin 3000 received wide circulation among CEC customers and attendees at various IRE conferences. It clearly defined the machine's architecture including the Quick Access Bands and B-Register. The command list was revealed but only with instruction mnemonics, not numbers, since these would result from the logical design process that would be conducted by Dr. Ernst Selmer and that was barely under way. Selmer carried out the design throughout much of 1952 in Pasadena, Princeton, Bergen Norway and at his country home near Vestby, Norway. Sibyl Rock wouldn't formalize her discussions with customers and industry groups until March 17, 1952. However, by February 15, 1952, this nascent machine was clearly creating some "buzz" in the industry. At Burroughs, H. M. Livingston noted in a memo to Mr. John Howard (with carbon copies to six others) that an electronic digital computer was being constructed for Atlantic Refining Co. by CEC. Cost was estimated to be less than $100,000. Both Atlantic Refining's headquarters and Burroughs initial computer ventures were located in distant Philadelphia! On March 17, 1952, Rock distributed, within CEC, a summary based on her interviews and discussions. A few key points emerged. Tying a computer to a mass spectrometer was not viewed by CEC customers as reasonable since the computer would stand idle most of the time. Knowledgeable customers expressed "...more or less polite disbelief in our ability to build the proposed machine for $50,000." But, price was not as important a factor once the machine was decoupled from the Mass Spectrometer. Eight decimal places was not sufficient. A great variety of input-output equipment would be demanded. Simplicity of coding was important. The scientific market showed a great deal of talking interest but "The data processing market is here now. (merchandising, utilities, banking, insurance...) ...The first person in the field will have a substantial advantage, but there will probably be room for competition." It's designed so just one operator - a girl clerk, say, with an elementary knowledge of bookkeeping - could handle it easily. Engineers being what they are, there were probably a number of back-of-the-envelope calculations done at CEC to calculate the ambient temperature inside an upright piano filled with 4,000 vacuum tubes. 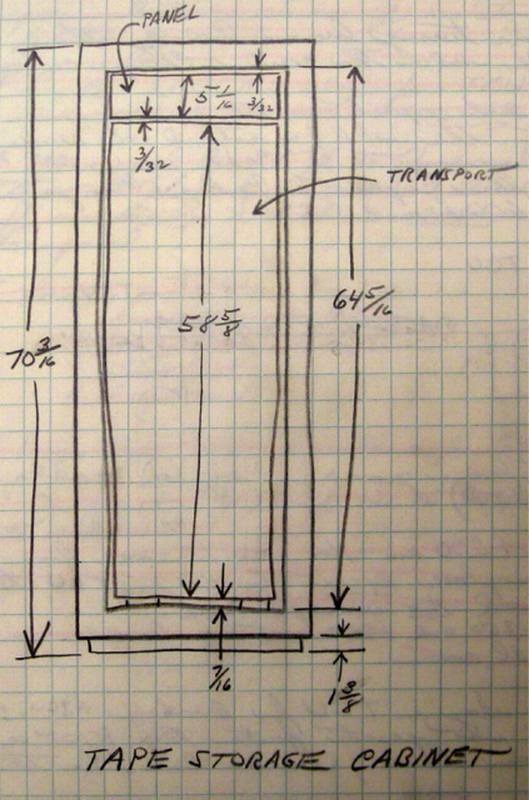 This might be a good place to note that the final tube count on the Datatron was 1,525; the cabinet size was 143 1/2 x 78 x 28 and the selling price was $135,000. That price, however didn't get you any input-output equipment or an operator's console. Follow this link for prices, weights and power consumption. By March 31, 1952, the word size issue had been resolved. The CEC Computer would utilize ten digits plus a sign. Work on the memory drum was progressing slowly. The high-speed loops were proving difficult to implement. In early July, 1952, John Alrich and Fred Fox reported that that they had successfully performed decimal addition by tying together the breadboard adder, A register, D register and add-subtract control. In October of 1952, there was a breakthrough on the Circulating Loops. The Quick Access Band had retained its information for several hours. By March of 1953, multiplication and division commands were functioning and in April, 1953 they were reported to be functioning at full clock speed plus a comfortable margin. A few potential customers were making visits to see the breadboard machine in action. At this point there were still two separate breadboard systems, the Memory Breadboard and the Control Breadboard. They were scheduled to be combined in May of 1953. A Mr. Turner, from NACA (The National Advisory Committee for Aeronautics. Renamed to National Aeronautics and Space Administration, or NASA in 1958) was scheduled to visit in late June. Turner had expressed his disbelief that the circulating loop memory was possible. In parallel with the breadboard systems, work had begun on the first "production" system, known as the Prototype Machine and designated the 36-101. This machine would remain internal to CEC and be used as a demonstrator. The first two customer systems had been sold and they were designated 36-102 for JPL(The Jet Propulsion Laboratory at Cal Tech) and 36-103 for NBS (The National Bureau of Standards) Corona Laboratories. In August of 1953, plans called for completion of 36-102 by January 1, 1954 and 36-103 by February 15. It would be the end of November, 1953, before the drum would be installed in the 36-101 prototype system and circuit debugging began. On November 10, 1953, John Alrich transferred to another project that would end up building the first "personal computer" under a contract with IBM. He worked with John Lentz to produce the IBM 610 Auto-Point. This was one of two outside contracts that CEC took on in order to generate some immediate revenue from the computer team. The other was to build a sixteen inch drum for Stanford Research Institute (SRI) which was busy cobbling together the prototype ERMA check processing system for Bank of America. Bank of America eventually took bids from numerous companies to create the production version and this would eventually lead to General Electric's entry into the computer industry. The prototype is operating, more or less, at 100KC./ Thursday of this week the attempt is to be made to run the first major routine, probably one of the acceptance test tapes. The following Monday it is hoped that the official logs can be started. On January 29, 1954, a press conference was held announcing the CEC Type 203 "Electronic Brain." The 36-102 shipped to JPL and was powered up in July. A brief clarification on model numbering is probably in order at this point. CEC utilized a five character scheme for managing their development projects. For example 30-nnn for "computers." That's how the earlier analog computer became a 30-103. The computer project that developed the prototype Datatron was project 30-203. Turning the early computer into deliverable computer systems was a new series of projects, the 36-nnn series. As a result, the JPL system was project 36-102 utilizing a 30-203 computer. 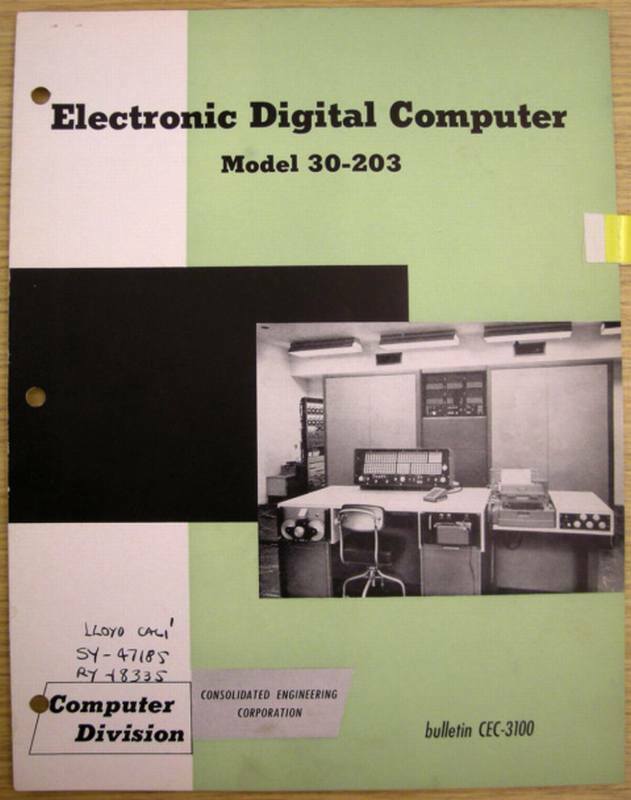 Once ElectroData was spun off from CEC, the computer was referred to simply as a Type 203. 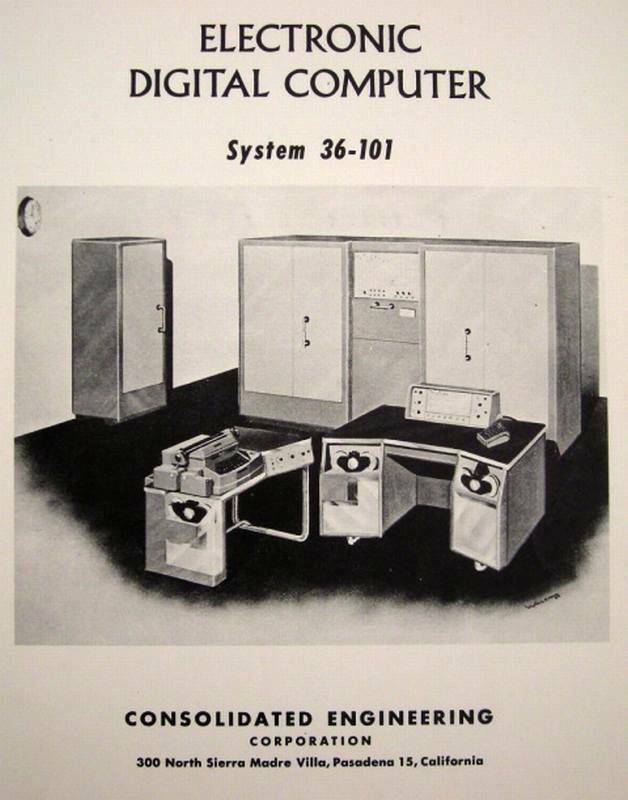 In June of 1954, L.P. Robinson chaired a meeting to formalize specification requirements for the central computer for the Type 204 Computer System. "In simplest terms, the 204 is a 203 with sufficient additions to operate with magnetic tape equipment." Needless to say, the tape drives existed only on paper at this point. A number of patents were issued to ElectroData (Burroughs by the time they were issued) for Datatron development work. Here are the more significant ones. Follow the links to find details. U.S. Patent 2947479 credited to Ernst Selmer for the Datatron BCD Adder. U.S. Patent 3143644 credited to Ernst Selmer for the Datatron Control Unit. U.S. Patent 2892183 credited to Ernst Selmer for the Drum Coincidence Control. U.S. Patent 3022006 credited to John Alrich for the Floating Point subsystem. U.S. Patent 3000556 credited to Larry Bewley and Jerry Foster for the Cardatron subsystem. U.S. Patent 2835882 credited to Allan Beek et al. for the Digital Tape read-back circuitry. U.S. Patent 2927304 credited to Jim Paquin for the Magnetic Head Switching System on the drum. U.S. Patent 2862664 credited to Duncan MacDonald for the 13-key Electrical Keypad. U.S. Patent 2914752 credited to Duncan MacDonald for the Datafile multi-bin Tape System.